FORT BRAGG, N.C. – In a packed auditorium at the U.S. Army John F. Kennedy Special Warfare Center and School at Fort Bragg, JAVA (Japanese American Veterans Association) Vice President Wade Ishimoto, retired Army captain, was inducted as a Distinguished Member of the Special Forces Regiment on April 25. Accompanied by his wife Bobbi, Ishimoto was the sole living inductee to the Special Forces Regiment, also known as the Special Forces Regimental Hall of Fame. On hand to witness this historic moment were several family and close friends, including Command Sgt. Maj. Ernie K. Tabata, the first Japanese American Distinguished Member of the Special Forces Regiment; 2nd Lt. Yohei Sakamoto and his wife Jaclynn; and Karen Conlin, civilian aide to the secretary of the Army in Virginia, accompanied by her husband Sean and their son Maclain, who is Ishimoto’s godson. Also in attendance were Lt. Col. Jason Kuroiwa, U.S. Army; Lt. Col. Mark Nakagawa, U.S. Army (retired); and Lt. Col. Kay Wakatake, U.S. Army. 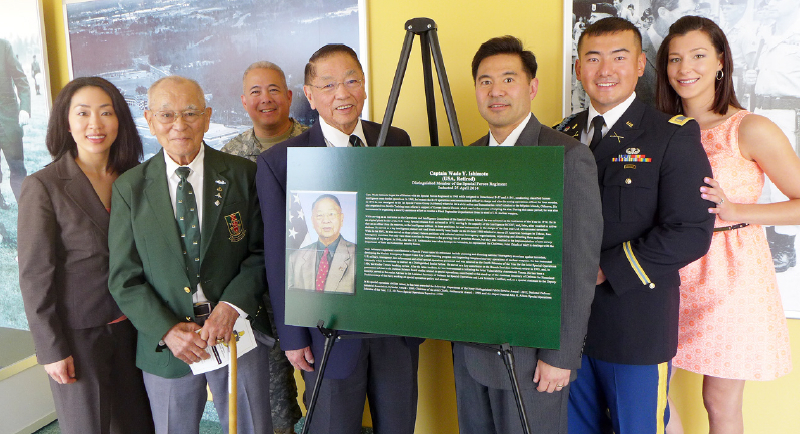 Ishimoto’s dedication to military service has made him a legend in the Special Operations community. He began his affiliation with the Special Forces Regiment in 1968, conducting classified human intelligence cross-border operations in Vietnam. He continued service with the 1st Special Forces Group (Airborne) while leading a civic action and humanitarian relief mission to the Miyako Islands, Okinawa. He was also the intelligence officer and road block security team leader on the ill-fated 1980 mission to rescue 53 American hostages in Tehran, Iran. Even in retirement, Ishimoto continued to contribute to the Special Forces community, including planning and directing national interagency exercises against terrorism, developing the Nuclear Emergency Support Team Key Leader training program, and improving recapture/recovery operations of nuclear weapons.